Noah Maria Victoria wrote her first poem at the age of 13 or 14 as a homework assignment. She composed “The Window,” a metaphor for her journey and countless trips to Children’s Hospital and the National Institutes of Health clinical centers. “My car window has been my companion the entire time,” she says. Today, Noah is an 18-year-old Positive Exposure Ambassador who blogs and contributes poetry to the PEARLS Project ,a groundbreaking educational program for students, teachers, and healthcare providers to learn about the real life experiences of individuals and their families living with genetic, physical, cognitive and behavioral differences. 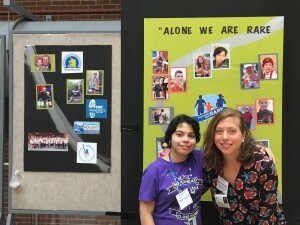 She has taught nearly a generation of medical student and residents not only about her disease but about what it means to live with a rare disease, and to approach life with humor and a positive attitude. 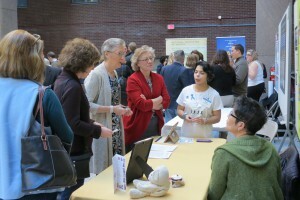 As an advocate, she is a member of the Running for Rare charity marathon team and hosts a booth at the NIH for Rare Disease Day, representing the team and its effort to support NORD’s Undiagnosed Program and pay for out of pocket expenses for patients and families enrolled in the NIH Undiagnosed Diseases Program. Recently, she rallied adults in her church community to call their congresspersons and urge them to vote “yes” for the 21st Century Cures Act. Noah is a very tall 4’8” in every sense of the world. Born premature, she was diagnosed at 6 months of age with Abetalipoproteinemia (Abeta), a rare genetic condition that results in a malabsorbtion of fat which leads to a number of complications. She stopped growing at the age of 13. As her mother says, “She is missing this tiny little protein, and the importance is so massive.” Noah also has unexplained symptoms of debilitating dysautonomia, and cystic changes to her bones that facilitated her enrollment in the Undiagnosed Diseases Program. Frequently in pain, she fights to make an impact for everyone fighting a rare disease. Noah’s poem “The Tree” will be featured this year in the Children’s Inn “Book of Hope” provided to donors to this home-away-from-home for pediatric patients and their families being treated at the NIH Clinical Center. my companion through the darkest of times. ran away once the eyes caught glimpse of light. I knew then that I was not alone. NORD is honored to tell Noah’s story as part of its 2016 Rare Impact Awards. Read the stories of all of our 2016 Rare Impact Award Honorees here.